Whether you choose a battery-powered or a corded plug-in hedge trimmer, you'll find it's incredibly user-friendly and convenient. If you're looking for something that's easy to carry and doesn't require knowledge of small engines, this is the tool for you. 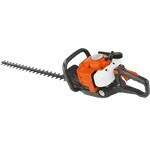 Gas hedge trimmers use 2-cycle engines, so you'll have to mix gas and oil in the fuel tank. However, they're ideal for large yards that require more heavy-duty trimming. Because there's no cord, you're free to roam wherever the hedges take you. Double-sided blades are more common and also cut more efficiently. Single-sided blades are safer because you can always keep the cutting edge away from you. A wide range of blade lengths provides different user experiences. Longer blades allow you to trim bushes more evenly but may be tougher to wield. Smaller blades, such as 18" are sufficient for trimming average-sized hedges and bushes. 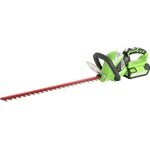 Hedge Trimmer Buyer's Guide - Find out How To Pick The Perfect Hedge Trimmer. Our string trimmer how-to library can help you pick the perfect electric string trimmer, gas string trimmer, walk behind string trimmer or brush cutter.